At RedFin Charters, we know our sharks! Catch one of the wonders of the world as we target different species of shark from Bonnet Head, Atlantic Sharpnose, Black Tips, Bull, or Tiger sharks in one of our shark fishing charters. 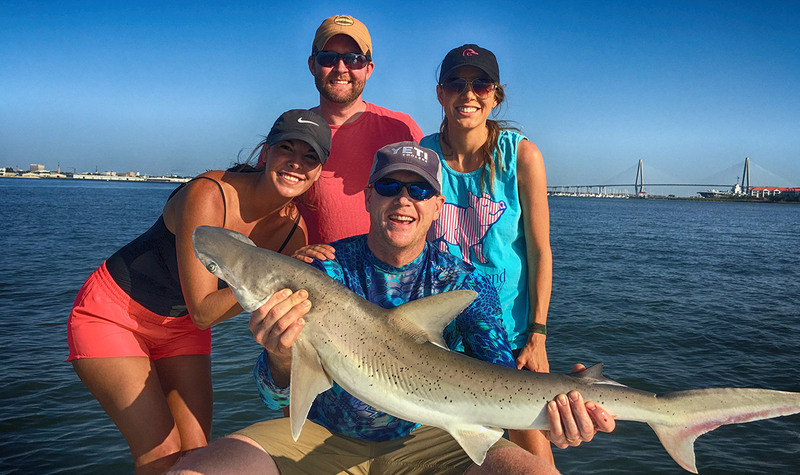 We fish for sharks around the Charleston Harbor and they can range in size from 10 pounds to well over 250 pounds or 10 feet long. We offer 2, 4, 6, and 8 hour trips. For bigger sharks, we recommend at least 4 hours since they can take up to an hour to land. Target: Bonnet Head, Atlantic Sharpnose, Black Tips, Bull, or Tiger sharks. 2 Hours - $250 up to 3 people (add $50/person up to 6). 6 Hours - $600 up to 3 people (add $50/person up to 6). 8 Hours - $800 up to 3 people (add $50/person up to 6).